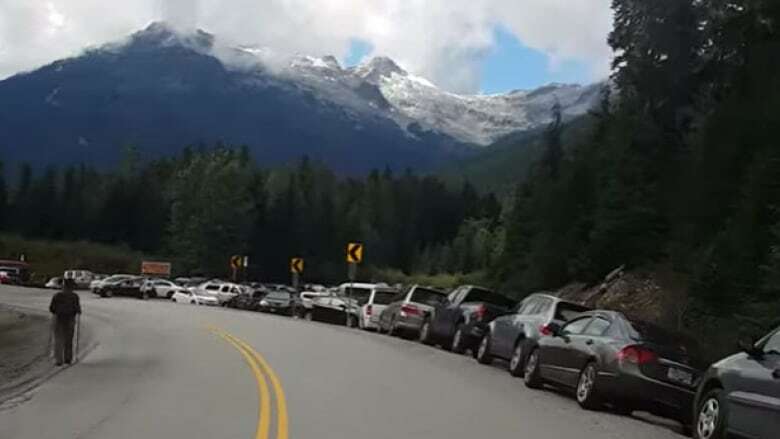 If the lineup of cars parked around the Joffre Lakes trailhead is any indication, the popular B.C. hiking trail just north of Pemberton was swamped on Labour Day weekend. So much for the solitude of nature. The trail is renowned for its three glacial turquoise lakes. Video posted to YouTube from Sept. 3 shows a massive line of cars parked on both sides of the trailhead. "So that was three kilometres of cars," the person taking the video can be heard saying. The driver also passed a tow truck that was towing another car out of the ditch. Parking is currently free at B.C. parks, but the video sparked lots of comments on Reddit, with some saying B.C. Parks should consider charging admission while others feel the parking lots should be expanded. The B.C. government says parks along the Sea-to-Sky corridor, including Joffre, have grown in popularity, and it is trying to find a solution. "Ministry of Transportation staff are engaging with key stakeholders such as the Village of Pemberton, Squamish Lillooet Regional District," it said in an emailed statement. "Staff [has] also been working with B.C. Parks to address parking and look at potential upgrades to the intersection on Highway 99." Tthe Ministry of Environment says B.C. Parks is looking at whether the existing parking lot can be reconfigured to ease congestion.